Mouseman style golden adzed oak compact chest of three long drawers with panelled sides, by the "Fishman" (D Slater), possible apprentice of the famous Robert (Mouseman) Thompson of Kilburn. Carved signature fish to top of chest and unusually, adzing to the oak on top as well as sides and front. 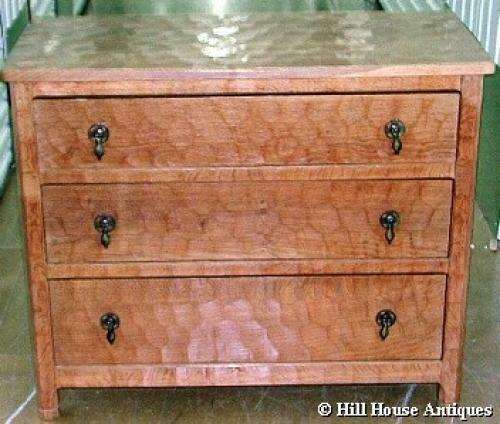 Nicely cast Cotswold style drop handles to drawers. Approx 36" wide, 30" high and 17" deep. Circa 1950s/60s.